Iodine is a dietary element found in seawater, rocks and some types of soil. Dietary elements are minerals that the body needs. Iodine rich foods include sea fish, shellfish and sea vegetables like kelp. It can also be found in some land plant foods too. Nutrient levels are not consistent in plant foods though. This all depends on the amount of iodine in the soil where the plants grow. This article will highlight the connection between iodine deficiency, reduced metabolism and weight gain. We will look at the role of selenium in restoring healthy iodine levels in the body and how selenium itself directly promotes weight loss. The body needs iodine to make thyroid hormones. These important hormones control metabolism and a plethora of other important functions. You can read more about the role of iodine in the body in the Iodine As Medicine post. Hormones are special chemical substances in your body that act like messenger molecules. 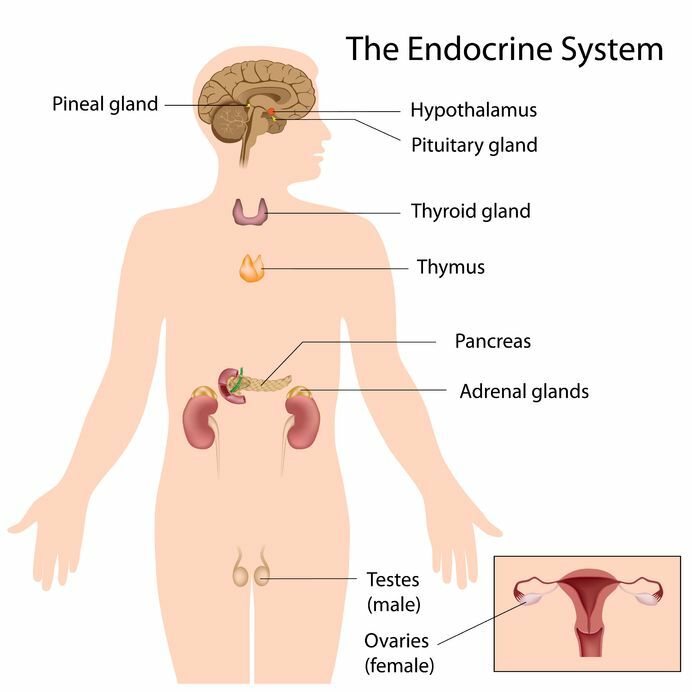 The endocrine glands make and secrete hormones into the bloodstream as your body needs them. Controlling hormones is essential to metabolism, which is the body’s process of generating energy from nutrients. Here are the major glands that make up the human endocrine system. In this article we are going to focus on the thyroid gland. The thyroid is a small, butterfly-shaped gland in your body. It is located in the neckjust in front of the windpipe. If you could see your thyroid it would look like a little bow tie. It plays a crucial role as it influences almost all the metabolic processes in your body. The thyroid helps to control your metabolism. It does this by secreting thyroid hormones into the bloodstream. Once in the blood they travel to different parts of the body to do their work. This is how thyroid hormones affect the body’s metabolic rates. It regulates how fast or slow your brain, heart, liver, muscles, and other organs in your body work. In essence, metabolism is the rate at which your body burns energy. Thyroid hormones help to regulate metabolism. You can think of your thyroid as one of the body’s main “master switches” for hormone regulation. The thyroid uses iodine to make thyroid hormones. These cells combine iodine and the amino acid tyrosine to make active (T3) and inactive (T4) thyroid hormones. The scientific name for these hormones is triiodothyronine (T3) and thyroxine (T4). This is what happens when your thyroid is in good working order. Men and women across the country work hard and use tremendous discipline in order to lose weight. However, some are unable to reach a healthy body weight despite best efforts. This is the case when you have have hypothyroidism, or an under-active thyroid gland. Given the high and increasing levels of iodine deficiency and related diseases, when it comes to weight gain and metabolic issues, it is worth considering that an under-active thyroid may be the cause. Problems with the thyroid gland can develop quite slowly, over many years in some cases. There are not usually any notable symptoms early on either. This is why so many thyroid issues go unnoticed for so long. When your thyroid functions properly it helps to maintain metabolism. It also prevents the accumulation of body fat. A healthy thyroid produces about 20 percent of the active (T3) hormone and 80 percent of the inactive (T4) hormone. An under-active thyroid gland slows down your metabolism. When this happens, you burn fewer calories and generally feel sluggish. Furthermore, an under-active thyroid gland promotes excess weight by causing water retention. 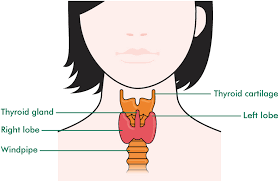 The body holds about 1500 mg of iodine with up to about 50 mg stored in the thyroid gland. The thyroid gland cannot function properly without it. Iodine is a vital component of thyroid health. The body needs iodine so that it can make enough thyroxine. Thyroxine is the main hormone produced by your thyroid gland. It helps regulate your metabolism and the rate of fat burning in your body. In short, iodine helps with weight loss by supporting your thyroid gland which is part of the process that regulates the body’s metabolic rates. About 30 percent of iodine intake goes directly to the thyroid gland. The problem is that the body does not store it as well as other minerals, like iron for example. Furthermore, excess iodine gets eliminated quickly once it is in your system. A typical American diet does not provide sufficient amounts of iodine. This can contribute to sub-optimal thyroid function. If you have too little iodine in your diet, hypothyroidism and weight gain can occur. Selenium is a trace mineral that is essential for good overall health. The body uses it to regulate thyroid hormone metabolism. Like iodine, selenium gets into the body through foods eaten and/or from supplements. Having sufficient selenium means you will have more energy, reduced stress and higher metabolism. It also helps your body fight viruses. Selenium is known as the Goldilocks nutrient. It is an important component of good nutrition however the body has a low upper limit tolerance for it. Beyond this level negative side effects can occur. We must keep this in mind because many Americans are not deficient in selenium, and if they are deficient, it is not by a large amount. The US RDA for adults is 55 mcg for adults, 60 mcg for pregnant women and 70 mcg for breastfeeding women. The upper limit is estimated at 400 mcg. Taking 200 – 400 mcg for long periods of time can also lead to negative side effects. Access Your Energy. Reclaim Your Health. After taking iodine supplementation, patients have described vivid dreams, dispelled depression and have no more cold extremities. Furthermore, they reported more overall energy and less fatigue. This is according to Jorge D. Flechas, MD, whose sub-specialties include iodine therapy for thyroid and breast tissue disorders. Iodine supplementation will also help with weight loss where deficiency exists. However, the main use of iodine as a supplement here is to help correct a deficiency. The public has not been well-informed about iodine. Many who struggle with weight loss need not blame themselves. It is in part due to misinformation about iodine. Now that you are armed with the right knowledge the first step is to start correcting your iodine deficiency by supplementing with iodine. Once you begin your body will start to detoxify. Make an effort to eat healthy and drink lots of mineral water (or water with dissolved salts) to help with the detox process and see results faster. As you move past the heavy detox phases you will have noticeably higher levels of energy and focus. We recommend that you do not take iodine supplements after 2pm because it may keep you up at night. The final step is to make use of your new-found energy and focus and take action by becoming more active. This will help your body to detox even more and more iodine will be available throughout your body. Now running at a higher metabolic rate your body will begin to use up its stored resources. You will feel better overall and this will be a great opportunity to establish an active lifestyle. By then you will have jump-started a natural cycle of health restoration. Many who exercise regularly do not need to summon incredible amounts of will power to get moving. They already have excess energy at their disposal that needs to be used up. Moreover the excess energy makes the activities more enjoyable. Why shouldn’t you have it the same? The Zen Haus Iodine Supplement has a dosage that is enough to begin gradually restoring healthy levels of iodine in the body. It is also sufficient for supplementing the increased iodine needs of pregnant and lactating women. Other supplements are supplying low dosages of about 150 mcg which reflect outdated guidelines. These smaller amounts were always inadequate for total body supplementation. We now live in a world where there is an epidemic of iodine deficiency and so the dosages have to reflect that. The dosages need to go beyond preventing goiter and address the needs of thyroid disorders, pregnant and lactating women, the rest of the body and other serious health issues. It is important to note that the Zen Haus Iodine Supplement includes Selenium. This is a trace mineral that works in conjunction with iodine. It is crucial for helping the body to recycle iodine. 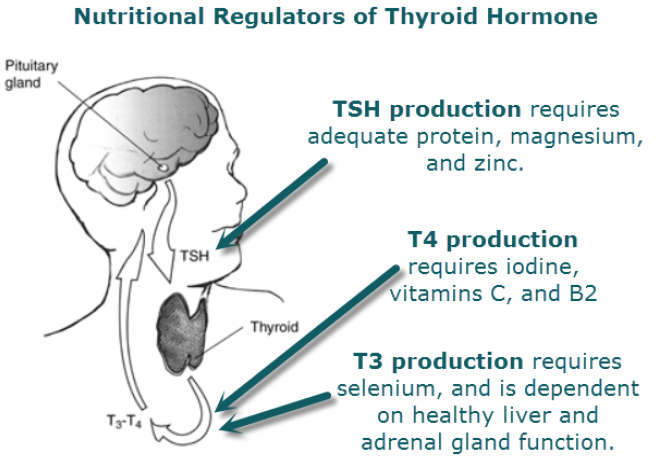 Selenium helps to make enzymes that convert inactive thyroid hormones (T4) to active thyroid hormones (T3). It is also beneficial for removing mercury and other heavy metals from the body. In fact, Selenium has many crucial roles to play in the body, many of which are beyond the scope of this article. We want to make sure there is enough selenium to metabolize the iodine. We also want to keep our selenium intake below 200 mcg while supplementing over long periods of time. Since many Americans are not severely deficient in selenium, we can assume we are getting roughly the 50 mcg of selenium, which is the US RDA amount. After careful analysis we decided to include 50 mcg of selenium per pill to accompany the 12.5 mg of available iodine. You will then have enough selenium to metabolize the iodine and have the option of increasing the iodine dosages while keeping the selenium amounts below 250 mcg of selenium. Anyone taking 4 or more pills, or 50+ mg of iodine, regularly on a daily basis, should consult with a physician. Why Zen Haus Iodine Supplement? The Zen Haus Iodine Supplement comes in tablet form. The tablet form is more stable and we have ensured that the tablets are small and have no taste. The tablet is also longer lasting and more convenient than liquid forms. It is even more cost effective too, when compared to liquid alternatives. It is a safer alternative to consuming large amounts of sea foods which contain harmful metals. It delivers iodine to the body using a potassium iodide compound which the stomach handles well. Potassium iodide is converted to the form of iodine that the thyroid needs. The first step in the synthesis of thyroid hormone is the uptake of iodide into the cells of the thyroid gland. This is done by the Sodium-Iodide symporter (NIS). Your body needs the iodide form of iodine. Learn more about this in the Why KI? article. By the way, even potassium helps with weight loss because it aids recovery after a workout and helps the body flush out water and sodium which reduces bloating. Since the time this article was posted we have adjusted our position on the inclusion of molecular iodine in iodine supplements. After some discussions with active members of the iodine-taking community we have accepted that there may be some benefits of molecular iodine in supplements. Namely, that it may help control stomach bacteria, displace toxic halides, and/or be useful for new-takers who may have damaged NIS. We have created a Dual Form version of the iodine supplement based on the iodine/iodide intake in the Japanese diet. To learn more read the post on Iodine and Iodides in Seaweeds and Supplements. notifications for the latest articles and research on iodine therapy.